The trendelenburg gait is caused by a unilateral weakness of the hip abductors, mostly the gluteal musculature. This weakness could be due to superior gluteal nerve damage or in 5th lumbar spine lesion. This condition makes it difficult to support the body’s weight on the affected side. During normal gait, both lower limbs bear half of the body weight is some part of stance phase. When one lower limb is lifted in swing phase, the other takes the entire weight. During the stance phase of gait, the pelvis tilts downwards on the weight-bearing extremity and hikes up on the non-weight bearing extremity. But when there is a hip abductor weakness, the pelvis tilts downwards instead of upwards on the non-weight bearing extremity. In an attempt to lessen this effect, the person compensates by lateral tilt of the trunk away from the affected hip, thus center of gravity is mostly on the stance limb causing a reduction of the pelvic drop. The gluteus medius and gluteus minimus are the two main hip abductors,support the opposition of the pelvis and prevents the pelvis from dropping. The superior gluteal nerve arises from contributions from the L4- S1 nerve roots. This nerve exits the pelvis through the sciatic notch to supply the hip joint, gluteus medius and minimus muscles and also Tensor fascia lata. Trendelenburg gait occurs when a patient has paralysis/paresis of the hip abductors. Hip abductor weakness may be caused due to neuronal injury to the superior gluteal nerve either due to nerve entrapment or by iatrogenic factors. Trendelenburg gait is also observed in patients with developmental dysplasia of the hip, congenital dislocation of the hip (CDH), congenital coxa vara, or coxa valga secondary to other disorders like Legg-Calvé-Perthes disease or slipped capital femoral epiphysis. In these aforementioned conditions, the abductor muscles are normal but they have a mechanical disadvantage. Patients with Slipped capital femoral epiphysis also have a muscular weakness that can lead to trendelenburg gait. Trendelenburg gait is also seen after Hip replacement surgery and femoral fixation with intramedullary nail. In patients with hip replacement, trendelenburg gait ensues due to the surgical dissecction of the gluteus medius muscle during surgery to expose the hip joint; thus the dysfunction in the abductor muscles. This resolves as wound healing improves. Other conditions in which a Trendelenberg gait may be observed include muscular dystrophy and hemiplegic cerebral palsy. 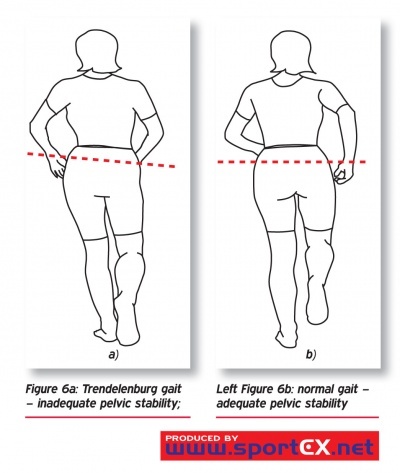 A trendelenburg gait is characterized by trunk shift over the affected hip during stance and away during the swing phase of gait and it is best visualized from behind or in front of the patient. During gait, the pelvis tilts downwards instead of upwards on the non-weight bearing extremity. In an attempt to lessen this effect, the person compensates by lateral tilt of the trunk away from the affected hip, thus center of gravity is mostly on the stance limb causing a reduction of the pelvic drop. Observation of the patient’s gait from the side enables the examiner to detect stride and step length deficiencies as well as motion of the trunk and lower extremity in the sagittal plane, including the extensor or gluteus maximus lurch in which the patient thrusts the trunk posteriorly to compensate for weak hip extensors (gluteus maximus muscle). Observation from the side also enables detection of ankle dorsiflexor weakness and footdrop leading to the inability of the foot to clear the ground, which is compensated for by excessive lower extremity flexion to facilitate the floor clearance (steppage gait). Bilateral weakness of the gluteus medius muscle: the gait shows accentuated side-to-side movement, resulting in a wobbling gait or “chorus girl swing”. Some people compensate this by flexing their trunk over the weight-bearing hip. The modified McKay criteria is useful to assess if a patient has Trendelenburg gait. These criteria measure pain symptoms, gait pattern, Trendelenburg sign status, and the range of hip joint movement. Osteopathic Manipulative Treatment (OMT) could result in improved gait parameters for individuals with somatic dysfunctions, as measured by a GaitMat II system. Trendelenburg gait is an abnormal gait caused by weakness of the hip abductors. Therefore, the main purpose of physical therapy with regards to this impairment is to strengthen the abductors of the hip. An appropriate exercise to strengthen the hip abductors is to have the patient lie in side-lying on the unaffected side and abduct the upper leg towards the ceiling. To make the exercise more challenging, a weight or theraband can be placed around the active limb. Other exercises in the treatment of Trendelenburg gait include functional closed-chain exercises, lateral step-ups and functional balance exercises. It is also important to strengthen the rest of the hip muscles on the affected side. The use of an Electromyogram (EMG) biofeedback reduces trendelenburg gait by an average of 29 degrees. The average stride length has been shown to increase from 0,32 ± 0,3m to 0,45 ± 0,2m and the speed of gait has been shown to increase from 1,6 ± 0,4 kmh−1 to 3,1 ± 0,5 kmh−1. EMG device provides warning tones, giving feedback of improper gait through sensing the level of gluteus medius activity. Patients with trendelenburg suffer from abnormal range of motion in hip and trunk; so, a wall mirror biofeedback could also be used. This treatment is used to increase the hip and trunk range of motion. The patient get visual feedback about how he/she walks. The therapists watches and gives advise/correction to posture, so as to facilitate proper gait re-education. ↑ Hensinger RN. Limp. Pediatr Clin North Am. 1986; 33:1355. ↑ 2.0 2.1 Pomeroy VM, Chambers SH, Giakas G, Bland M. Reliability of measurement of tempo-spatial parameters of gait after stroke using GaitMat II. Clin Rehabil. 2004;18(2):222-227. ↑ Vasudevan PN, Vaidyalingam KV, Nair PB. Can Trendelenburg's sign be positive if the hip is normal?J Bone Joint Surg Br. 1997;79(3):462-6. ↑ Apley G. Apley’s system of orthopaedics and fractures. 6th edition, ELBS, 1986. p243. ↑ McGee SR. Evidence- based physical diagnosis . Elsevier, 2007. p51. ↑ Hensinger RN: Limp. Pediatr Clin North Am 1986; 33:1355. ↑ Gilliss AC, Swanson RL, Janora D, Venkataraman V. Use of Osteopathic Manipulative Treatment to Manage Compensated Trendelenburg Gait Caused by Sacroiliac Somatic Dysfunction. The journal of of the americal osteopathic association. 2010;110(2):81-6. ↑ Flynn JM, Widmann RF. The limping child: evaluation and diagnosis. J Am Acad Orthop Surg 2001;9:89-98. ↑ Richard J. Ham, et. Al, Primary care geriatrics: a case-based approach, Mosby Elsevier, 2007. ↑ J. Gross, J. Fetto, Elaine Rosen, Musculoskeletal Examination, 3rd Edition. ↑ McGee S., Evidence based physical diagnosis, 3rd edition, 2012. ↑ HardCastle P, Nade S. The significance of the trendelenburg test. J Bone Joint Surg Br November. 1985; 67-B (5) :741-746. ↑ Saleh M, Milne A. Weight-bearing parallel-beam scanography for the measurement of leg length and joint alignment. J Bone Joint Surg Br. 1994; 76(1):156–157. ↑ Paley D. Normal lower limb alignment and joint orientation. In: Paley D (ed) Principles of deformity correction. Berlin:Springer. 2002. p. 1–18. ↑ Gage JR. Gait analysis in cerebral palsy. 1st edn. Clinics in developmental medicine, vol 121. London:Mac Keith Press, 1991. ↑ Emara K. Pelvic Support Osteotomy in the Treatment of Patients With Excision Arthroplasty. Clinical orthopaedics and related research. 2008; 466: 708-13. DOI 10.1007/s11999-007-0094-2.